Description: The Wisdom Literature of the Bible (Job, Psalms, Proverbs, Ecclesiastes, and Song of Songs) is filled with practical principles for everyday life. While some Christians are deterred by the pragmatic character of these matter-of-fact guidelines, they are as integral to God's purposes for His people as the explicitly theological material that dominates other parts of Scripture. The Wisdom books tie these two streams of God's revelation together in a way that enriches and strengthens the church. 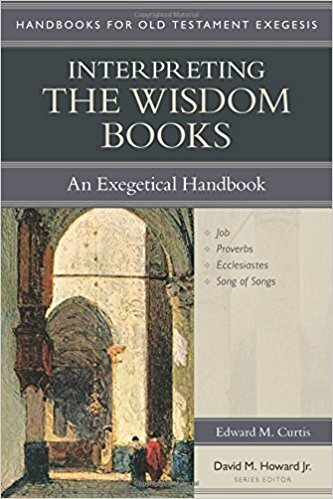 It is a thorough resource for pastors and teachers to help them navigate the sometimes bewildering waters of the Wisdom Literature. Citation: Serena McMillllan, review of Edward M. Curtis, Interpreting the Wisdom Books: An Exegetical Handbook, Review of Biblical Literature [http://www.bookreviews.org] (2019).